HERO's Gaming Blog: CSM Live Q&A being reported! A webway to better gaming. CSM Live Q&A being reported! Well, not on my blog, but on Faeit 212's site he has a person there who has all the info it seems. I don't know what else to say, but I've been spamming updates as we go. I'll have all the compiled info here. Refresh the page if you don't want to sort through all the unanswered questions since I'll only post what he answered here! Update: 10:57pm PST - The guy went to sleep, so I have everything updated below. Q:Noisemarine info and vehicle upgrades for slaanesh. A: Noise marines are overall a little bit cheaper. Sonic Blasters are 36" salvo now. Aspiring champions have access to a whip that prevents enemies from denying challenges. Other weapons are the same. Q: What are the God's specific new Psychic powers tables? Did the named characters get point cost reductions and/orcool new abilities? Any new character, maybe from the Horus Heresy series? A: Most named characters are the same, but overall a point reduction. Abbadon is the same points and does not make terminators troops. Q: Is it true that there are NO new Special/Named Characters? Are there any old Special Characters coming back from previous Codices? Are Noise Marines getting any new weapons/toys? Do Thousand Sons still require a Sorcerer upgrade? Can Predators, Land Raiders, or any other tanks take Sonic/Slaanesh upgrades? Is there anything in the Codex that changes how the Allies Matrix behaves (ie; turning Imperial Guard into Brothers in Arms)? A: There are no new named characters. Thousand Sons come with an Aspiring Sorcerer in their basic 5 before adding more Rubric marines. There is a sound-based vehicle upgrade but it's more of a Word Bearers item than Slaanesh. I haven't read any special character adjusting the allies chart. Q: How is GW representing specific gods in armies? Do you get point reductions on Slaanesh marks if your HQ has one? Do Sorcerers have good buff/debuff powers? AKA the better type of psychic powers. A: The only impact on Marks is that HQ models make corresponding cult units Troops. There are 2 debuff spells in Nurgle and Slaanesh, 2 buff spells in Slaanesh. Q: How did they fix posessed? Any new weapons options on the oblits? How does the rumored CC oblit work? What weapon options and cost do the cultists get? Any option for fast summoning the daemons from the chaos daemon codex (sacrifice rituals and stuff)? A: The "eye of the Gods" table is actually several tables. First you roll to see what table you roll on, then you roll what you get after winning a challenge, killing a monstrous creature or walker, or annihilating a unit in close combat. One of the tables is Daemonic Gifts. Possessed get to buy (not roll) up to 3 boons from the table. They can take special weapons, but not heavy weapons. they respond very well to dark apostles getting an extra benefit when one is in their unit. Q: Daemons weapons are AP? or Drach'nyen is AP2? Q: Will Terminators be able to be given both marks and icons to essentially be cult terminators? A: Yes, but it's expensive. Taking both increases the cost of the second and Terminators pay more in the first place. Q: Is Khorne getting anything to combat the very shooty/psychic oriented 6th edition? As they are against using magic do they get anything to bring them up to the level of competitiveness psychic gods have? Q: Dear honored guest, I'm going to ask some questions I think all CSM players want to know. Thank you so much for doing this! Is it true that you can mix and match Marks and Icons on various CSM units? 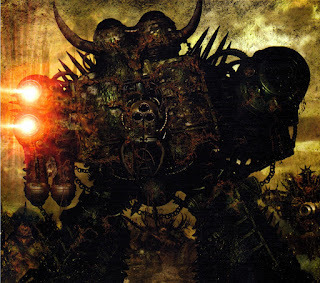 For example, can you take +1T from Mark of Nurgle and the Icon that gives them FNP to essentially make Plague Marine Terminators? Is it true that if you take a Chaos Lord and give a specific mark (such as Mark of Slaanesh), you will be able to unlock Noise Marines as Troops? Lastly, and this one is more Legion specific because I'm a Death Guard player, but I hear Plague Marines are getting a points increase. Should I be worried? Are they going to be worth the points or will I find myself taking more basic CSM with Mark of Nurgle? A: You can mix/match Marks and Icons. +1T / FnP isn't as good as a Plague Marine, they're worth their points. HQ unlocks corresponding cult troop. Q: What initiative does kharn strike at and does he get anything new? A: Kharne strikes at initiative 5, and he gained armour bane which I guess is new. He's AP3, but for every model he kills (not wound inflicted) he makes an additional attack at initiative 1. Not quite the same as warrior born as it doesn't keep growing, but it's very devastating for someone with 8 attacks on the charge. Q: What is Kharns pyschic defense? Q: Will Khorne Berzerkers chain axes have any special rules, similar to power axes? Q: Is there any fortifications available IN the codex you can select? A: There are no new fortifications but there is a unique upgrade to fortifications. Q: Are there still Havocs and can they still be unique in that they can use auto cannons? Q: Defilers: bigger? Meaner? More weapons? Other options? They are my favorite. How does demonic possession work now? A: They're the same except they have the Daemon special rule, 4 hull points and a 5+ invulnerable save. Q: I have a quick question? Will we be able to build a sonic landraider or a sonic tank? Will the Sonic weapong be finecast? and will we have mopre fluff on the Emperors childern? Also, the two Primarchs, that were whip out before the Hersy started? Were they the first to join Chaos? A: There is a sonic upgrade for tanks, but it's not a noise-marine thing. I don't know about upgrades being finecast. I know that there is intent to upgrade the basic CSM box to support all the cult troops to be able to achieve any of the weapon combinations from the entries (including everyone having soundblasters). No idea on the 2 primarchs. What options are available to Raptors (jump troops) and the 'possessed raptors' that are mentioned. How do they differ? A: Raptors still have access to special weapons, only the aspiring champion can take special melee weapons. They are reduced in points. The Night Lord's raptors are a lot like vanguard (they cannot charge on deep strike though), but they have 2 attacks base + dual power weapons (ap3) with the shred special rule and are 35 points each. Q: I'd like to know the points cost of the 5 TS with sorcerer to see what the cost of the sorcerer is (basically is it a crazy amount of points and is it worth it...the current incarnation is rip-off central for what you get IMO). A: 150 points for 4 Rubric marines and 1 Aspiring Sorcerer. Unit size 4-19. 20 points per Rubric. Still slow and purposeful, unless the sorcerer is alive then relentless. Q: Great!! is a little cheaper, but the aspiring sorcerer still have to buy one power or he come with at least one? A: He gets a roll included. Q: Is it going to be as broke as Grey Knights? A: Having not had an extensive amount of time with the rules, from what I have read so far, there seems to be a theme of if you want it, you can have it, but you have to pay. Basic CSM squads actually end up cheaper than a tactical squad if they take only 2 special weapons and their aspiring champion has bp / ccw. It's possible, however, to clear 400 points on a 10 man squad with a transport. Q: What do the melee obliterators get weapon-wise? Are they 2w with a 2+ / 5++? Q: Have the marks changed in what they do to normal squads? Undivided still reroll morale tests? Tzeentch still +1 invuln save? Does an undivided lord give any benefit to his army? Can you give marks to vehicles and, if so, then what is an example effect? Can you still buy specific psychic powers or are they all randomly selected from certain disciplines? Did Thousand Sons go back to 2W and no invuln save like 3.5 or are they still 1W with a 4++? Can chaos marine squads combat squad? A: Marks are the same. Undivided Lords get Inspiring Presence command trait, and improved reserve manipulation. Dedicated transports get the mark of the unit they're bought for, for free. Only units with the same mark can ride in it, (so be careful). Undivided vehicles can transport anyone. Q: How many Troop options are there? Is it just basic CSM and Cultists? Cult units become troops with the right mark on your warlord. Q: Also, is the dragon thing the only flier in the Codex? Q: What are the rules for the new flyer? how does it take out other flyers? armour values and hull points? fast attack ur heavy support? Q: Do iron warriors get any characters? What specials rules do they get? Q: What units are getting nerfed to oblivion and/or What units are getting buffed into every list? A: Daemonicly possessed vindicators I think will be in every list, with their ability to potentially regenerate destroyed weapons at start of the chaos player's turn. Q: What can you tell us about the Oblits and the Maulers? Specifically, are they both Heavy Support slots? A: Maulers are elites, Obliterators are heavy support. You can have both. Q: Woot! That's what I was hoping to hear. Does the new Daemon engine go into the Heavy support slot as well? A: the new siege unit is heavy support. A: Yes and yes. The mark of khorne for instance gives it Rage and a unique weapon option much-like blood talons except it's a giant rotary saw. Q: What has changed with the Plague Marines? How much are they now? I also hear they get poisoned weapons? Is that all weapons shooting and melee? A: They are 120 for 5, + 24 for more. Poisoned only in melee. Can throw their blight grenades to reduce enemy movement speed to 2d6 pick the highest, or if already rolling d6 for whatever reason (i.e. cover, charging) pick the lowest. Q: Hello good sir. I'd like to know some general info about possessed. Is there a way to move them around? Also, what makes them unique. Also, how big is the EOTG chart? A: The chart is 6 charts of 6 options. Q: Does the mark of Tzeentch still grant a Psyker level? What is the psyker level of a Rubric Squad's Sorcerer? Does he have to pay for his powers or are they included? What is the psyker level of an HQ Sorcerer? Can you increase this and how? Do all the sorcerors only get 1 power per psyker level? Is there an option to get extra powers (for the HQ and Rubric)? HQ sorcerer are rank 1, can be upgraded to 2. There is a piece of wargear that lets you reroll up to your mastery in dice after you have rolled, but only each dice once. Q: How many points is a Berzerker squad? Are there any new Land Raider variants? Or options to change the armament of the current Land Raider? What kind of stats does the Dragon have? How large can an Obliterator/Mauler unit be? Are they still able to teleport? Can CSM icons be used to prevent allied Daemons from scattering? That's all for the moment. Thanks again! There is a new land raider, it's a lot like a crusader. 1-3. Maulers cannot deep strike, but are not slow and purposeful. Q: Disappointed that Berzerkers are still so expensive. Have they gotten any better? A: Yeah I don't get why they are the same price as grey knights but can still get owned by them! Q: What is the points cost of the basic Chaos Marine? since other rumors point to a decrease in points. A: 70 for 5, 14 for each additional marine. Aspiring Champion is a 10 point upgrade. For every 5 models in the squad you get a special weapon. If the squad is 10 or more, one model can exchange a flamer(5 pts) for a Heavy Bolter, meltagun(10 points) for an Autocannon or Missile Launcher or a plasmagun(15 points) for a Lascannon. Marks range from 10-50 points, Icons range from 10-40 points. Q: Does Kharn still hit his own people on a To-Hit roll of 1 (one of the more flavorful rules, imo)? Is there any downside to Typhus turning cultists to zombies? Was Ahriman shown some love and is he still 250 pts? Does he get any tricks other than psyker level 4? What type of ranged attacks does the new demon engine have? Can allied Chaos Daemons units be summoned to CSM icons? A: Kharne still hits friendly models. Ahriman is mastery 4, can cast multiple powers per turn, gets access to almost all lores and has a default psychic attack much like smite but longer range that he can use in addition to his normal psychic powers per turn. The siege engine has a melta blast template. Yes daemons can be summoned to your CSM icons if you have a dark apostle. Q: How many troops can our land raiders carry? Any variants or new special abilities/upgrades that are noteworthy? A: 12 for the basic, 16 for the new one. New one can ram fortifications and you can launch an assault on the occupants, except that you don't consolidate at the end, you remain locked in combat. Q: Do units come with a default icon (for deep-strike) or do you have to pay for one of the special ones? What are the effects/point costs of the icons for a normal unit of CSM and for Term's? A: No one comes with icons by default, cult troops get marks by default. Marks are the same, except Khorne which is Rage, not +1 attack and has a point decrease. Terminators pay 50% more. Taking an icon if you already have a mark costs an extra 20 points. Q: Does this mean Berzerkers are only one attack base? A: berzerkers are 2 attacks, rage, furious charge, frag and krak grenades, bolt pistol / khornate weapon (ap5 in close combat). They're 5 attacks at str5 ap5 each on the charge. They can also upgrade to have chainfists in the form of 2 handed chain-axes. Q: Are Traitor Guard in? Do they get Leman Russ squadrons? Do mind giving a breakdown of those units available? A: No traitor guard. Just cultists. Q: Any new main turret options for Predators? Do Bikers get any new toys, or are they pretty much just CSM on bikes? Overall, does the Codex seem to promote a mixed army, or does it feel like you can make decent mono-god lists? Are there any side benefits to sticking with one Chaos God? What's the Leadership of the Cultists? Typhus turns them into Zombies, but do any other Special Characters change them? A: No new turret options for predators. Bikes get nothing new, just CSM on bikes with combi-bolters instead of bolters. You can get away with a mono-god list, but at that point you should be using cult troops most likely. If you're adding havocs to your berzerker army, there's no real point in giving the havocs the mark of khorne for instance. In that sense you're varied. It's not like 3.5 where we'll see thousand son troops with nurgle vehicles to min-max. Q: How much do the different marks cost for a CSM squad? Is it a per model or per squad cost? How do the costs differ for Havocs and Termies? A: CSM/Havocs/Raptors/Chosen pay the same cost. Termies pay more. Q: How are things looking for generic Undivided folks? Are they going to be just as competitive or is Cult still going to be where the money is? A: Undivided is a lot cheaper than cult marines. A lot. Playing undivided gives you many more bodies. Q: Does a Daemon Prince grant any bonuses to his army or is that a unique thing for lords (and sorc's)? A: He kicks *** and takes names. But otherwise, no. Q: Daemon Princes flying or jump if they have wings? Any way to get biker troops? What sort of anti-flyer is available? Can cultists do the platoon thing like IG? A: Daemon princes are jump if they have wings. No way to get bikers as troops. the flyer you get is retardedly good at blowing up things that are zooming. cultists cannot platoon, but you can take up to 30 of them in the first place. Q: If daemon weapons are simply ap 3 then why bother using them now. Do they have extraordinary abilities that are worth their expensive points cost now? Q: The "Hatred: Space Marines" rule....is it ALL Space Marines (Chaos and Loyalist), just Loyalist, or just Vanilla? My God. If half this stuff is true, I'm going to be SOOO happy. Khorne Berzerker army lead by Kharne is gonna be hell to face again, as well it should be! Tzeentch Mahreenz still pretty zappy and badass. I'm all in favor. To say I'm really excited is an understatement. I know exactly what you mean! As someone that wants to play an Undivided list, I think that this codex will finally make it a viable option! So here's hoping that these pan out as true! I think Papa Nurgle will be very happy I'll be using normal CSM with MoN in addition to Death Guard. Looks like a combination of the two will be most cost effective since normal ones get access to heavy weapons. Now to look for some GUO alternatives.. I'm really liking what I'm reading. This really puts my mind at ease. More Death Guard on the way! DE: Time to add in some allies! 6th Ed. Wound Allocation.. why?! DE: Taking advantage of 6th Ed. Copyright: Lawrence King, March 2010-Present. Awesome Inc. theme. Powered by Blogger.